See Fun Pictures and Get All The Info You Need to Have an Amazing Night at Brodie's Tavern! Three Levels of Excitement at H2O Dance Club and Rooftop Patio! See Fun Photos of Each Floor and Learn What to Do When You're There! It's Definitely About Time for You to Stop by IBT's in Downtown Tucson for Your Next Night Out! Great Photos and Awesome Details About Tucson's One and Only Leather Bar! It's Time For You to Venture-N! Where are all the gay bars in Tucson? Tucson has always has been very accepting of all people, especially gays. One of the great benefits of acceptance is less segregation. There are some bars that are considered actual gay bars in Tucson, and the most popular is IBT’s. Awesomely, is that a word? Well, I’m going to use it. Awesomely, you will find gay, lesbian, trans and straight people all hanging out together in whatever bars or venue in Tucson. The community here is so evolved and conscious, that everyone simply hangs out with each other anywhere and everywhere. No matter gender, sexuality, ethnicity or class — Tucsonans embrace and celebrate diversity to reinforce the values of love and abolish hate and negativity. One of the most active areas for gay, lesbian, LGBT, LGBTQ and strait people to socialize is downtown all throughout the light rail district. The light rail travels to all the downtown hot spots. It goes from the Mercado through downtown on Congress St. And then from downtown, it goes up through 4th Ave and on to the U of A main gate square area. There are currently over 30 bars and clubs to explore and more and more keep popping it everywhere. It’s an exciting time to live in and visit downtown Tucson! There are so many neat places to choose from it’s hard to choose favorites because every place has it’s own style, vibe and perks but here are a few places that have good drinks. If you are looking for a good craft cocktail or craft beer, I highly recommend Reilly’s underground speak-easy style bar or 47 Scott, a secret, hole-in-the-wall bar. Both bars are in downtown Tucson and are actually right across the street from each other on Scott and Pennington right off of Congress St. Tell one of the bartenders that you want something sour and fun and they will make you something delicious and creative. Both of these gems feature amazing bartenders and an incredibly diverse and comprehensive bar complete with tinctures, aperitifs and digestifs. The bartenders are not simply pouring drinks, they are mixologists. I also like Agustin’s Kitchen at the Mercado San Agustin. This bar/restaurant is at the beginning of the light rail and has plenty of easy parking. They have some great craft cocktails on their menu and Agustin’s is sometimes a host to a G3 events. You’ll love the outdoor courtyard area when the weather is right. One more drink you should try is the Father Kino margarita at Pasco. Pasco is located at the University of Arizona main gate. It’s not your typical margarita and it’s one of my favorite. This bar uses many fresh juices and herbs in their concoctions. 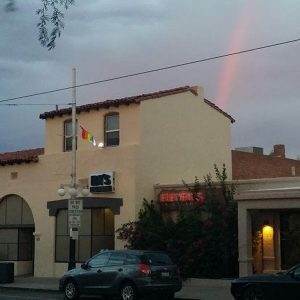 Why does Gay Tucson keep information about closed gay bars? We keep this information for our friends from out of town. Those who may have been to one of these gay bars in the past and need to know that they have closed.